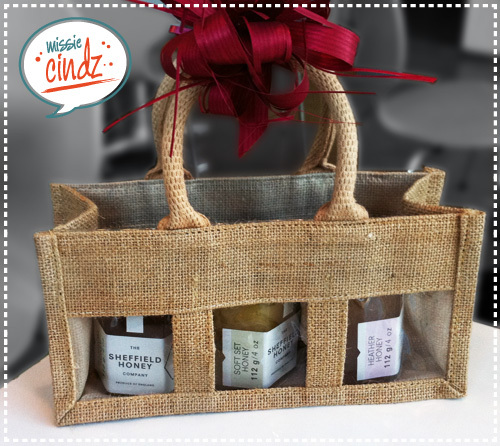 Here’s another rather nice gift idea I’ve stumbled across today – The Sheffield Honey gift packs. The packaging by @DEDass is so clean and beautiful (I don’t want to open it), and comes in three (112g) jars of honey types: Heather, Soft Set and Blossom, all neatly contained in a cute woven canvas bag (and includes the big red bow too! – as pictured). Priced Â£12.95, these are available from a range of stockists in Sheffield (including Sheff’s @PJtaste) or you can email The Sheffield Honey Company where someone will be more than willing to help with your enquiry. I always appreciate foodie gifts (hint hint, oink oink) and maybe ‘Someone’ will treat me to something local, or homemade, like jam, local honey, or a farmers market find – which are all interesting gift ideas. Perhaps you have a rather ‘Cheesy’ special one? How about this Cheesy Two Hearts gift set from The Cheese Shed (as blogged a couple of weeks ago). Happy Shopping!